If you are active online, you have no doubt seen the call to take May Day 2012 as a day in support of the 99% A day where you will forgo shopping, work, school, to stand in solidarity with those who are against corrupt corporations and big bank bailouts. Anyone who reads my poetry, knows I stand tall with these supporters, and I am ready to change the world. This is the power of poetry! For me, the call to pick up my pen and write out my frustration with the world is strong. It is paramount to my sanity. It allows me a voice. One where I can shout my opinions to the world (as misguided as they may be) and ideally, open up communication with like-minded folks the globe over. Those who disagree, need not read my words. They can turn the page, switch the screen, or maybe, if I’ve played my cards right, they can grab a pen and write their own poem in response. No matter your beliefs, your opinions, your grievances, there is room for your words. Imagine a world where words are the true weapons (in my world…they are) The power you hold in the pen you bring each week is god-like. Cherish it, respect it, nurture it and open yourself to the gifts it can bestow upon you. Just over a year ago, I never imagined I would find so many wonderful, thoughtful, colorful word benders. I am constantly amazed and in awe of the absolute talent that fills these virtual pub walls. If I could bring you all under my wing to allow you the ability to write to your heart’s desire, I would do it in a New York Minute. Poets, the world needs your words now more than ever. Know your worth, and never let doubt shadow your pages. There was a time in our history when each and every one of you would have been revered above all…that hasn’t changed for me, and I’ve got a feeling, it’s the same for many who visit us each week. Can you feel that…that tug on your heart…don’t panic…it’s just the poem you were born to write! Post your poem to your blog. This is a free write. No prompt, no form, just a call for your words. Now the fun begins! Revisit Mr. Linky to search out other poets who have answered the call. Visit their links, commenting when compelled. We are community! We share, we tweet, we thumbs-up, and pin it! Use whatever social networking platform you favor to help spread the PoetLove! Thank you for the warm welcome!!! Always a pleasure to bump poetic elbows with you all!! BIG smiles!! LOVE the power of Poetry! Me, too, Tash!! So poignantly powerful! Thanks as always for hosting this. Here’s my A Knack For Limericks. look at anthony dropping the jazz hands…. I hear ya, Tash. Thanks for the powerful article. My May Day is for migraines (this year, at least), the library, the park, and construction paper. Sorry to let you down, Tash. We don’t live in the same world. Be well Poetess…My bubble is lawyers, bankers, contractors and appraisers…not to mention the clients…I wouldn’t wish my actual world on anybody! P.S. I made a really groovy music playlist for those of you who like to listen to soft sounds while you read poetry. Sarah McLachlan, Jewel, etc. I read somewhere that in time of revolution the first thing the kings an dictators did was to get rid the poets. I think it’s the poets job to say ‘the emperor wears no clothes’ which is a perfect metaphor for the falsehood and gambing nature of Wall Street. My poem today is about co-dependency on Neverland! happy open link night everyone…and great intro as well tash…and history proofs that words can be weapons for sure and have changed much when combined with smart action…happy writing and reading! I would rather read the poets of an era than the text books 😉 See you soon, boss! woohoo… Happy May Day everyone! Started early today Brian…I’m on your heels! The support you all have given me, the courage to share…yes, I am all YOUR fault…and so incredibly grateful for every word that falls from your pen, Steve! Loved the stench you stirred up this week! How did all those poets post so quickly? 🙂 Have been waiting for open link 42 all day! Can’t wait to mingle with you all later this evening. Thank you very much Tash! Hoping to share a few tonight. First one is humorous. I’d also like to celebrate the spirit of the introduction above! Had a great weekend at Fayette Lake, and here’s one of the pieces I’ve written about it. Enjoy! Such a warm welcome, Tash. We’d be there with you in a New York minute too!! This place is unbelievable, clicked in at #8 and by the time I entered my post it came in as #22. Less than five minutes in and the pub is rocking’! Can’t wait to see what’s served up this week! Couldn’t disagree with you more politically, I’m guessing… but I’m happy we disagree with our pens! 🙂 That we both agree is a wonderful thing. My poem is not political – usually never are. I thank you for hosting and I love dVerse! Loved the intro Tashtoo! All right people, let’s git ‘er done! Finding myself a bit tipsy after your heady call to arms. Can we smear on the war paint now? I’m revved up! i’ll be back tonight to visit others. ‘ello, e’llo! Thanks for invite, Tashtoo! You are the Hostess with the Mostest! Who drank my beer when I was in the rear? Free refills should lesson the pain! 😉 And for those of you who may not be aware, Sir. ihatepoetry ALSO has a wonderful collection available…just saying! Powerful words, Tashtoo. Thank you for reminding us of this energy. I have been reading two powerful poets recently, and they have impacted me in different ways: Wallace Stevens, and especially William Stafford. Stafford desrves to be read by more of us. Only about a year ago, did I come across him, and he opened some particular gates for me in influence. His honesty sings loudly to me. My new poem “I Wonder….” is influenced by his candor. nice prompt write up for may day 😉 thanks! Good for you, Adan! You sound like a very productive guy. Inspiring lead in, Tash. You are always a hard act to follow! Now I have to think of something especially good for next week. Thanks for hosting, and I’ll be back later to belly up to the bar–still in the middle of chores here. Mine is a re-post of an old rant – as Tashtoo seems to be in campaigning mood. I’ll be back to read in the morning. HI, everyone! Glad to be back … I think this will help ease my post-NaPoWriMo withdrawal. Shakes and queasiness … I’m only sort of joking. “word bender”. I like that! Words are very powerful. Let us use them for the greater good. Power to the poets. We rule the world! Looking forward to another great week of poetry! Good words Tash – I doubt we would be on the same side of a political argument, but I love your enthusiasm and support your right to voice your support for those you stand behind. And a powerful, poetic voice it is. Go get ’em! As long as we meet in the middle with poetic asides…we’re all good! 😉 Been LOVING your posts! As always honored to be here..where reading and writing means learning and growing. I wish I had the time and talent to spew forth a rant on the given subject but I don’t. I’m afraid y’all will have to settle for something I wrote a few days ago. Amazing poetry forum this is and I am in love with it. Though it is merely my second week here. I absolutely love this post. So rightly said. Thank you. Awesome sauce as they say! Love the words for understanding and solving issues. Well said. Good Afternoon Natasha…thanks for opening the pub this evening. Hello all… posted a link to my poem on the vampire mythos “The First Deadly Sin”, so if you’ve already seen it via Blue Flute’s column earlier this week – thamks! If not, then looking forward to seeing you there. Will get to reading everyone else’s offerings later tonight. Cheers! I hope you plan to share the rest of the series, Sam. Glad for this chance to share & read poetry each week. Oh goodness, bike riding will wear you out! how cool that my poem goes great with your intro, Natasha. Happy OLN! Gotta love divine intervention 😉 Awesome to see you Sheila…on my way! I’ve put my name in as I don’t want to miss the boat! this is another belfast memory! It’s always great to be back at the pub. Fine words, well spoken! Natasha, thanks for hosting tonight! Tug on my heart, that’s a line for a poem. Hello Tashtoo, I do not have a poem yet. yet is the key word there…smiles. A poet friend who does not have a blog and wishes to remain anonymous asked to borrow my blog so he could link up to dVerse. I agreed and linked his post as Anonymous Guest. Thank you for understanding. Thanks, Tash! Wonderful prompt though I’ve found it a bit intimidating, as the post I was going to use is a bit blase. So thinking it all through before linking something. I have made some rounds though. K.
haha…tash you have started a small global riot…captial cities are now burning…all because your intro…smiles…. Hi Tash – I don’t know – I can tell you downtown NYC is certainly humming with helicopters. Not such a good thing for those who live here! (I’ve tried shouting at them- shut up! I’m trying to write here. Doesn’t seem to work.) (Ha.) K.
wow…not one single helicopter over here…just birds….smiles…and a tired poet with a cup of coffee…haha…on the trail in a minute..
That is so nice. It must be early there – late here and tired also. But really loud, unfortunately. k.
A wee bit late, ergo a wee split of champagne pour vous. Cheers! champagne sounds nice jackie… cheers…and sleep well karin and brian..i’m off to work..
“my poem isn’t even political. ” So glad to read you say that, as I couldn’t find it so and was wondering what I was missing again. This week i feel myself outside of so much of the poetry I come across that I daren’t even comment much for fear of being shown up as a total non-literati. Hi all, Here is a colourful poem for the week. I’ll be reading lots in the morning! good morning poets…a little late getting back out on the trail…but ready for you now…have a great day every one! Yesterday was a busy day and while I read some last night, my brain seemed to have gone to sleep without the rest of me. More rested now I’m slipping into the pub after many are out on the trail. Want to say thank you for the visits of so many to my blog poems. It’s always uplifting to read your comments and know you’d take the time to read my attempts. Tash, you’re unflagging enthusiasm is a tonic that keeps us all going. You take your talent and hold it up with your optimism and your courage to give us all the inspiration to write, and the motivation to support others. 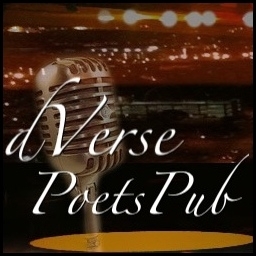 Thank you for all you do for dVerse Poets and for the Poetic community. Poets…just want you to know you are all amazing! The writes are blowin’ my mind! Still have no hope in heck of catching Brian out there…but I’m loving the trail!